Would you like to sing with us? 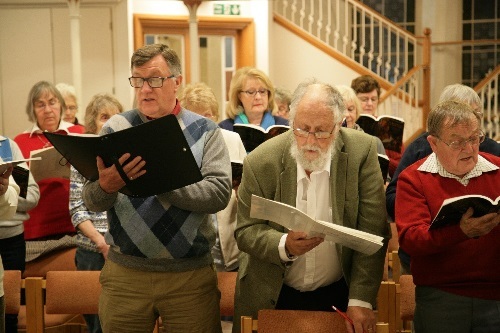 If you like singing in good company you will certainly enjoy being a member of the Witham Choral Society. Our 2018/19 singing season started in September. We rehearse at the Witham United Reformed Church from 7.45pm until 9.45pm every Tuesday in term time. We are currently rehearsing for our spring concert on 6th April at the Witham Public Hall, which is a lovely venue to sing in, with a bar available in the interval. New members are always welcome and you can join at any time during our season. Membership for those under 26 years of age is free. But maybe you don’t sing? Then why not become a Friend of the Society? If you enjoy our concerts and attend regularly why not support the Choir by becoming a Friend? Friends’ contributions are essential to the income of the Choir and we all appreciate this, it means we can have professional soloists and musicians to accompany our concerts. As a Friend you pay a contribution of £15 per annum, and with your agreement we keep in touch with you with early information about upcoming concerts, complimentary programmes and reserved seats on the night for you and anyone in your party (up to 4 seats). If you are a taxpayer you can also gift aid your subscription which will provide us with more income, the form for this can be found below. If you, or anyone you know, would be interested in supporting the choir in this way, please contact the Friends’ Coordinator, Christine, by email on hallhousetwo@hotmail.com or Stephen on 01245 390598 for further information.